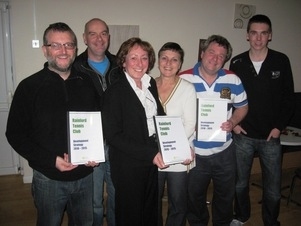 Rainford Tennis Club have officially launched their Development Strategy, which outlines their tennis plans for the next five years. Rainford Tennis Club are committed to developing tennis programmes and facilities in the village of Rainford to enable as many people as possible from the local community and surrounding areas to play the sport of tennis. Over the past two years, the Club have been extremely successful in increasing participation in all parts of their tennis programme and now need to increase their tennis playing facilities to continue growing the sport. The highlight of the plan is that the Club will have three additional courts at their home at the Jubilee Recreation Ground by the end of 2012. The new facilities will allow the Club to increase membership, participation, coaching, competitions, schools, talent development and community tennis.